Welcome to Found Off The Street, our look at cars found on the cape that rust liked so much it decided to summer there; Cape Cod, MA. Today we have a 1955 Ford Fairlane. With each passing year, finding a reasonably priced and ready to drive 50s car is an increasingly difficult task. With this in mind, this week's FOTS 1955 Ford Fairlane appears one of the rare cars that fits the bill. This old Ford needs nothing but a new owner to make a return to the streets of the cape rust remembered. 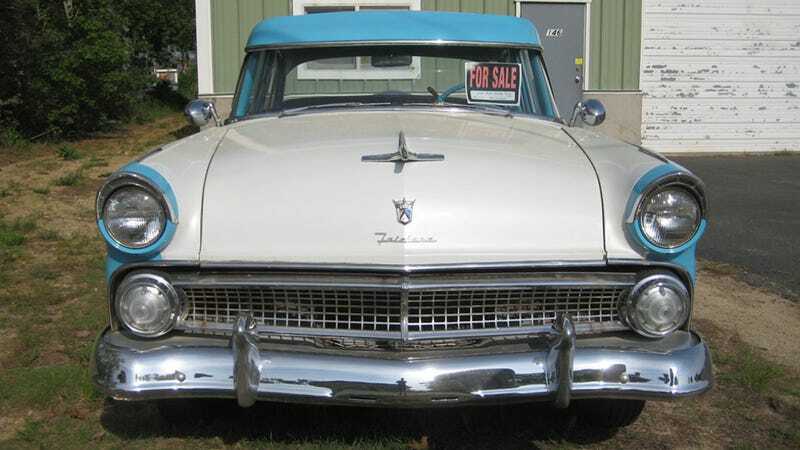 1955 was the very first model year for the Fairlane. The model, named after Henry Ford's estate "Fair Lane", replaced the Crestliner as the top of the line Ford upon its introduction. Six different body styles were offered for the Fairlane's first year with two available engine options—the 223ci straight six and the 272ci V8. All Fairlanes from '55 were easily identified by the distinctive side chrome design, seen on our FOTS car. This particular '55 Fairlane is a Town Sedan model, the least exotic and most popular Fairlane sold in 1955. It may not have been as fancy as the Fairlane Crown Victoria Glasstop or the Fairlane Sunliner Convertible, but equipped with the 272ci V8 this four door was still a fairly fancy Ford when new. 56 years later, the two tone paint scheme and unique design features have only improved with age. Most car lovers have a brand, time period or type of car they have a particular affinity for above all others. Mine is driver quality four doors from the second half of the 50s and the first half of the 60s, which meant the discovery of this 1955 Ford was particularly interesting. After giving the old Fairlane a thorough once over, beyond removing the continental kit, visor, skirts and spot light to personal taste, this old car looks like quite the ideal cruiser. I don't have the back story on this Ford, but it is easy to tell the car has been redone at least once. Judging by the condition of the car, I'd say it has spent the majority of the time since then sitting in a garage or as seen here, directly outside of one. The car is currently being advertised for a very reasonable $6500. We just hope whoever gets their hands on this Ford next won't be shy about hitting the streets of the cape rust remembered in this nice old Fairlane.